Not too long ago there lived a miner by the name of Helfin, who along with his trusty Sandan Solly would brave the depths of Neopia's treacherous gem mines and donate his earnings to the poor. They lived a happy life... until the day that the scheming Bori Miner caused a cave-in, taking Helfin's life. Determined to carry on his master's work, Solly sets out to sabotage the Bori's mining operation by stealing as many gems as possible. Allegedly caused a cave-in! You can't prove a thing! 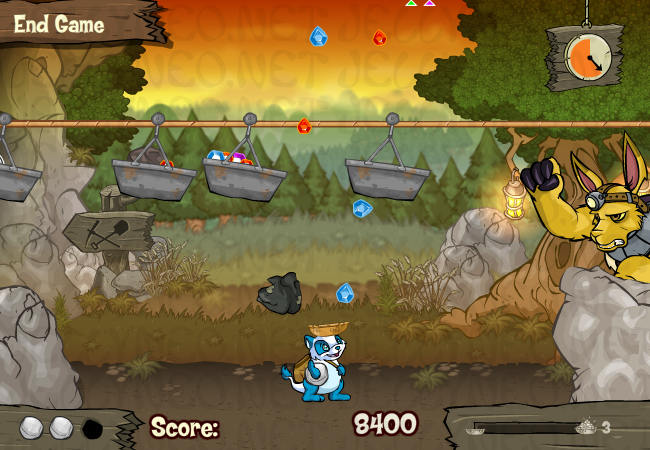 In Jumpin' Gem Heist, you control Solly's movement with your mouse, and click to throw a stone upward. Be sure to catch your stone after throwing it, as you have a limited number of them. The goal of the game is to knock gems out of the baskets moving overhead, collecting the gems when possible. The gems may be flung above the top of the screen; when this happens, their positions will be represented by arrows of the same colors. While the gems will shatter upon hitting the ground, neither this nor allowing the gems to reach the Bori Miner will affect your game in any way. You will only lose if you drop all of your throwing stones, shown in the lower-left corner of the screen, or if you run out of time, displayed in the upper-right. The game will begin with two minutes on the clock. If it weren't for my Sandan allergy...! There is also a meter in the lower-right, showing your progress towards the next level. This meter is filled by collecting gems, and with each level, the baskets will move faster. At higher levels, there is a greater probability that rock slides will occur, with dangerous flaming rocks falling from the sky. In addition to gems, the baskets will also hold various other items, which can have both positive and negative effects. Gives you an extra throwing stone. If your stones are full, it will instead award 750 points. Adds an extra five seconds to the game clock. Stuns Solly for three seconds, preventing you from moving him or collecting any gems or items, including your throwing stone. Flaming rocks from rock slides will have the same effect. Gems award points relative to their size, with the larger gems worth more. Because of this, it will usually be more worthwhile to try catching a single large gem than two or more smaller ones. Bear in mind, however, that if you manage to catch five gems in a row without dropping any you will receive a 1,000 point bonus. Neither collecting power-ups nor getting hit with a rock will break your chain; this will only happen if you allow a gem to hit the ground. You can also earn points by catching an extra throwing stone when you already have the maximum of three stored. Collect as many clocks as you can to maximize play time. If two baskets are close together, they can be hit with a single stone. Try to collect five gems in a row as often as possible for a 1,000 point bonus. At higher levels, the baskets will be moving fast enough that you can throw your stone at a second basket before collecting the gems from the first.